Eureka has fantastic eating establishments, and not just because of the good food. The ambiance people, it’s awe inspiring. It makes you eat a little slower and lounge a little more. Eating by myself was perhaps the strangest part of vacationing alone. 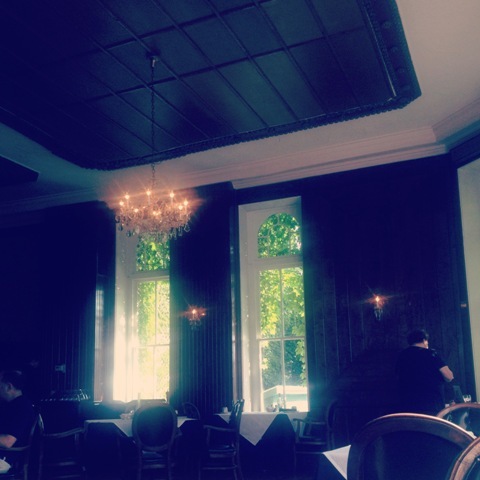 I had my first meal in the ballroom of the Crescent. It was so quiet, and people spoke so softly. I sat by myself in a corner, beneath a window covered completely in ivy, listening to ice in glasses and the distant hum of big band music. I imagined the wood paneled room full of dancing. I imagined it abuzz with talking, giggling girls (the Crescent housed a girls school for many years). I mean, come on, I don’t mean to beat a dead Harry Potter horse, but just look at that first picture. Us Americans won’t get much closer to Hogwarts. 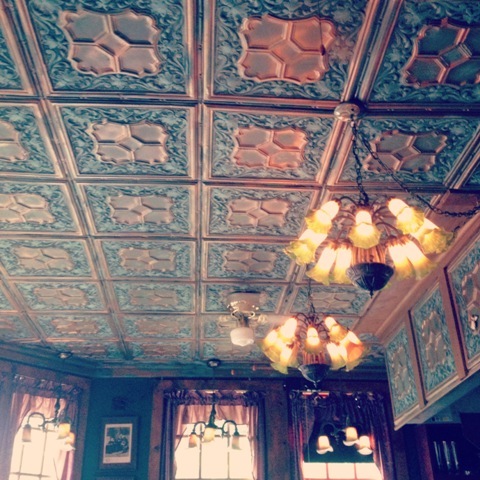 I ate my last dinner at Rogue’s Manor, and spent most of the evening trying not to choke because I was so busy looking up at the tin tile ceiling. I spent two hours there, eating, reading my book, sipping drinks. The wait staff didn’t hover, they just let me be. I didn’t say more than ten words, and I realized I really enjoy eating solo. On my last day I gassed up the car and checked out of the Crescent. I stopped downtown at Mud St. Cafe for a quick breakfast before hitting the road. I ordered a mushroom omelet with cheese grits right before a large family filed in and sat at the gigantic table next to me. Gals, I kid you not. She was talking at a completely normal decibel level. “No, I’m not shouting!” she insisted, still speaking at a completely normal level. The irony? The baby was screaming the entire time. “Ya’ll, I only have two hands,” she muttered, her shoulders slumped. I felt heart sorry for Elaine. I realize this happens from time to time in every family. Everyone takes a turn as punching bag at some particular juncture. It’s not ideal, but it’s still sort of our pack nature. Someone gets harped on for their hair, or clothes. Someone else gets ribbed about their job, or past breakup, or the way they threw fits as a child. The bad thing is, families have memories like elephants, and it can be unfortunate, because no one wants to talk about their bad elementary school grades, or major, or high school boyfriend when they’re grown. But, it happens. Sometimes families pick. But this family. Wowza. I’ve never seen anything quite like it. Bless Elaine’s heart. Maybe she was a loud talker when she was in kindergarten. Maybe she was kind of lazy in high school (although my bet would be she was just hiding from all of them). But darned if she would ever live it down in that family. If poop truly does slide downhill, she was at the bottom with a catcher’s mitt. 1. I’m going to do my best to make sure I’ve allowed my sisters to grow up in my mind. I think I do alright in that arena (mostly because they’re mouthy broads and would probably tell me quickly where to get off). But there’s just this tendency in families (especially among parents and older siblings) to forever freeze someone at an age, or a stage, and always mention it, and forget that they’re grown and over it. It’s just unfair. And annoying. I’m going to try to do better. 2. I’m going to dine alone more often. You miss so much, always talking and listening and laughing and being with other people. Sometimes its good to eat food bite by bite, without hurrying or gulping. Sometimes it’s good to take in your surroundings, relax and just observe for a little while. Observations are good, especially when you see a family like Elaine’s. May God bless that girl with a solo vacation of her own.